Died in Hospital #12 of bronchitis. 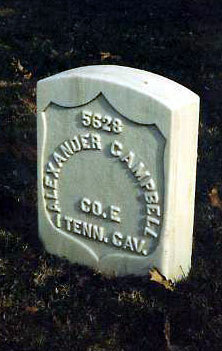 Alexander Campbell was born in 1828/1832. He married Millie Noles/Knowles in Cass Co., GA 1 December 1848. They had six children: Thomas Jefferson, born 2 June 1850; John Robert, born 3 August 1852; Samuel Henry, born November 1854; Sarah Ann, born 3 June 1857; Andrew Jackson, born 1 July 1859; and William Green, born 1 July 1861.